What is General Patton doing at Coppola’s? As 2017 comes to an end I wanted to share a memory of the restaurant. You see our restaurant wasn’t all about my family and I. It was also about our customers. Their memories became our memories. I learned so much from our customers. The following story is about a picture that hung on the wall in Coppola’s Restaurant men’s room. Ever since the picture was hung up on the wall in Coppola’s Restaurant men’s room it stirred up a lot of commotion. The infamous picture was of General Patton on June 6, 1944, when the Allied forces stormed the beaches of Normandy and invaded Europe. The Rhine River was Germany’s ancient line of defense; when American troops crossed the Rhine on March 7, 1945 at Remagen near Cologne, it was all over for the Nazis. General George S. Patton showed his contempt for the Germans by relieving himself into the river. On the rare occasion I went into the men’s room the only thing that I noticed about that 8 x 10 picture was that it looked oddly out of place lost on a blank wall. In the early 1990’s before my dad passed away, a loyal customer, the late Jim Quinn, brought in the picture because he said our men’s room needed some sprucing up. I found this extremely odd but it’s a men’s room and what do I know! Suffice to say that not only has this picture become a conversation piece for years but it has also provoked people to steal. The picture had been stolen so many times that we kept copies to replace the stolen copy. What’s funny about it is that they always left the frame! But that picture stirred up so many interesting conversations. A conversation that really stood out was when an out of town gentleman (here for the Vassar College Graduation) after returning from the men’s room wanted to speak to someone about that picture. My face flushed from embarrassment, I just couldn’t get the words out on what General Patton was actually doing trying to explain the picture. The customer was an older stately gentleman and I kept stumbling for words. It was at the end of the evening so I just directed him to the kitchen to speak to Jim. My embarrassment was all for naught since the only reason he wanted to talk about the picture is that he wanted to share his story that he was there with General Patton. This gentleman was one of the engineers from the 150th Engineer Combat Battalion that crossed that Rhine River many times during WW2. Well, I had to look up what exactly did an engineer do during the crossing of the Rhine River over 60 years ago. After reading about the 150th Engineer Combat Battalion, I was extremely impressed. I thought I would take an excerpt from the information I found so you can be equally impressed! 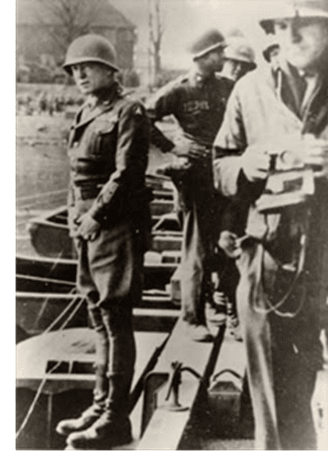 “It was during this week, in late March of 1945, that the U.S. Third Army under Gen. Patton, began its famous bridging and crossing operations of the Rhine. After the completion of the Battle in The Ardennes, Patton and his Army turned to the south and east attacking toward the Rhine. Without the luck of the 9th Armored Division, further to the north, who were able to capture the only intact bridge across the Rhine at Remagen, Patton’s Third Army faced the necessity of bridging the wide river with their own resources. There had been a total of 22 road and 25 railroad bridges spanning the Rhine into Germany, but with the exception of the Remagen Bridge, they had all been destroyed. The first unit to cross was the 5th Infantry Division that used assault rafts to cross the raging Rhine at Oppenheim (west of Darmstadt and south of Mainz) in the early morning hours of March 23. The 150th Engineer Combat Battalion (EC inflated the floats for the bridge in the rear area, moved them to the river in trucks, and by daybreak had assembled them into rafts. By 1880 that evening, a class 40 M-2 Treadway bridge was taking traffic. The following day, a second 1,280-foot class 24 bridge was completed in the same area. It was later upgraded to a class M-40 bridge. Without the benefit of aerial bombardment or artillery preparation, units landed quickly and established a beachhead that was seven miles wide and six miles deep in less than 24 hours. Several amphibious tanks of the 748th Tank Battalion crossed with the men of the 5th ID. When daylight came, the Luftwaffe attacked the enclave with 154 aircraft in an attempt to dislodge the foothold on the east bank. Effective anti-aircraft fires brought down 18 of the attacking planes and destroyed 15 more. By March 27, five divisions with supporting troops and supplies had crossed the three bridges constructed at Oppenheim. The entire 6th Armored Division crossed in less than 17 hours. During the period of March 24-31, a total of 60,000 vehicles passed over these bridges. After consolidating on the east bank, the Third Army continued its drive to the east, capturing Darmstadt on March 25, and arriving in Frankfurt the following day. But on this very night that the engineer from the 150th Engineer Combat Battalion from WWII had dinner at our restaurant and proudly recounted his experience with General Patton, we had an unusual coincidence occur. It was 10 pm and I had just locked up the front doors and turned off the sign when someone was knocking at the door. I didn’t know his name but his face was familiar so I couldn’t turn him away. It ended up being Jim Quinn’s son and grandson to have a drink at the bar. If you remember at the start of my story it was Jim Quinn who originally gave us the picture of General Patton. At the time I was thinking that General Patton relieving himself at Coppola’s is still keeping Jim Quinn alive in all of our memories. I really do believe that Jim Quinn must have telepathically sent a message to his son to come in to Coppola’s and have a Manhattan in his honor while he was remembered by all of us! May all your traditions and special memories keep your loved ones alive this holiday season! * After reading this memory to Jim he recalled another General Patton memory. Mind you that General Patton picture was always a conversation starter. This particular time started with accusations! It came from the mouth of a much younger gentleman. He was actually screaming at my husband, calling him a thief. Apparently, this young man’s grandfather was the photographer who took this particular photograph. He said there were only two originals and what was one doing in the Coppola’s men’s room. It took some coaxing to calm the young man down and convince him that it was only a copy! Sheesh who knew that a picture could cause so much turmoil! That Jim Quinn knew what he was doing when he wanted to spruce things up or should I say rile up? See our popular Broiled Shrimp Scampi recipe from our restaurant menu.